While Dhawan and Rayudu prepared with both the right and left arm throwdown specialists, Dhoni worked in the indoor nets with assistant coach Sanjay Bangar. India vs Australia 2018-19 ODIs: Half of Team India members are still rejoicing their historic triumph over Australia in the recently-concluded four-Test series, whereas, the other half are back to the business ahead of the upcoming three-match ODI series against Australia. The white ball specialists’, including veteran MS Dhoni hit the straps during an optional net session at the iconic Sydney Cricket Ground (SCG) on Wednesday. 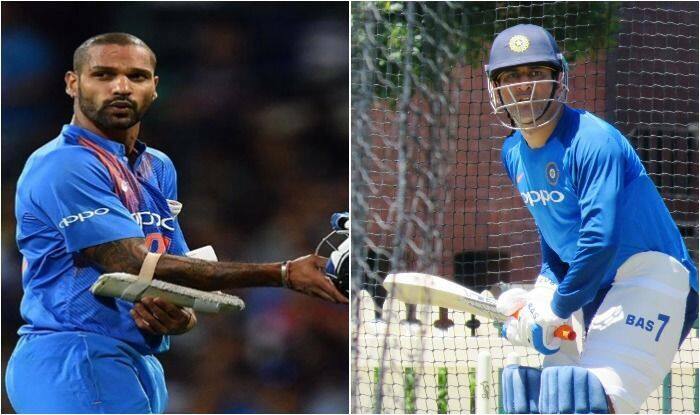 Along with Dhoni, Team India’s star opener Shikhar Dhawan and middle-order batsman Ambati Rayudu were also caught in action fine-tuning their skills with batting coach Sanjay Bangar. With the 2019 ODI World Cup on the horizon, the focus has firmly shifted to white-ball cricket with the arrival of limited-overs’ specialists on Tuesday. India have a long white-ball season lined up ahead of the marquee tournament in England this summer, with three ODIs in Australia and another five ODIs in New Zealand along with a three-match T20I series there as well. Australia then visit India for a return leg of five ODIs and two T20Is, before the 2019 Indian Premier League season gets underway on March 23. The quartet primarily took throwdowns as no specialist bowlers from the squad were present for this optional session. While Dhawan and Rayudu prepared with both the right and left arm throwdown specialists, Dhoni worked in the indoor nets with assistant coach Bangar. Meanwhile, former Australia and Netherlands pacer Dirk Nannes has complimented Jasprit Bumrah for his ‘tough’ step up from limited-overs’ to Test cricket without any disruption in rhythm or fitness. “I think the change from white ball to Test cricket is easier when you have got the skills, and he certainly does have that. But the challenge is to be able to do it consistently hitting the same spot time and time again, and he does that exceptionally well,” Nannes told PTI. “I think his dismissal of Shaun Marsh in Melbourne was absolutely magnificent. I cannot think of many other situations where a batsman was set up so beautifully, and the bowler executed a T20 skill in a Test to dismiss him. That was something special,” he added. Nannes said the key to Bumrah’s success is his physical fitness, even though he doesn’t appear to be someone who spends hours and hours at the gym. He added that barring a left-arm pace bowler, India have a complete bowling attack as concerns Test cricket. “I don’t think he looks like he does much gym work, but he seems naturally very strong physically. You would look at his action and think he would break down. But he is very flexible. You cannot praise him enough for the growth he has shown in such a short span of time,” Nannes said.